The Gray Report: What exactly is "balance"? 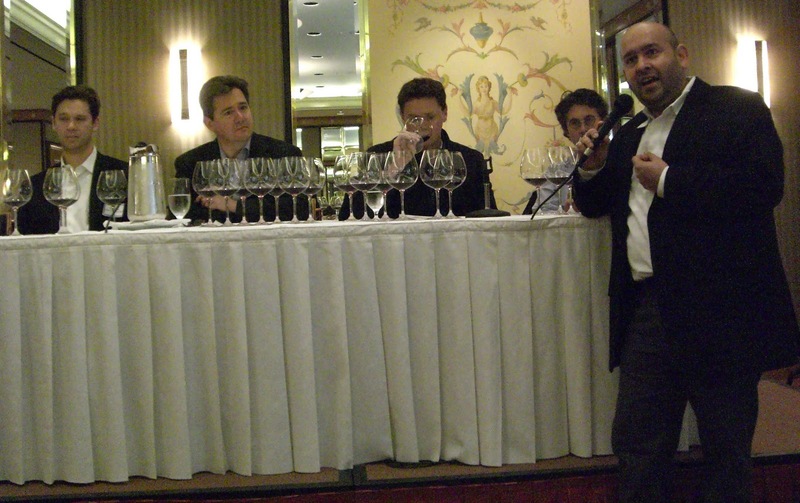 My column in Wine Review Online this week is about one of the most exciting wine events in San Francisco in ages: the "Pinot Noir: In Pursuit of Balance" seminar hosted by RN74 sommelier Raj Parr. The column is a little cynical (who, me? ), as I virtually wave the Stars and Stripes in the faces of all the Francophiles who attended. Just to clarify: Loved the event, love the Pinot makers who attended, love most of their wines, and I really love the fact that California winemakers are "in pursuit of balance." Which is what, exactly? The alternate column I could have written would say that the reason many American consumers don't seem to prize it is because we in the wine media do a lousy job of describing it. And with all the media firepower at this seminar, we didn't do any better. Ray Isle, wine editor at Food & Wine magazine, cited Potter Stewart's famous quote about obscenity: "I know it when I see it." Villa Mount Eden winemaker Jeffrey Patterson said, "When I can drink the whole bottle and the last glass is better than the first." The best definition came from Master Sommelier Geoff Kruth, who said, while putting an empty glass upside down on his head, "I learned this from Gary Pisoni -- a balanced wine is one you can wear as a hat at the end of the tasting." But how does a relative neophyte understand any of that? Perhaps the folks I see in restaurants leaving a half-bottle of Cabernet on their dinner table think it's their own fault for not appreciating its power. One thing that Isle declared by including Evening Land winemaker Sashi Moorman on the panel is that "balance" does NOT mean "low-alcohol" or "lightweight." Moorman's wines are medium-bodied (full for Pinot) and taste of ripe fruit, but they're still delicious. For a winemaker in the Santa Rita Hills, where the long growing season leads to ripeness that Burgundians would -- like a closeted gay politician -- both lust after and publicly decry, that's staying true to terroir. Moorman delivered my second-favorite quote* of the day: "Sometimes you come across wines that make you weak in the knees … but nobody ever says, 'Oh my God, that wine is so balanced'. I'm trying to make wines that are special." I like the sentiment, and I love great wines, but over the course of a month, honestly I would rather drink more wines that are balanced than wines that are special. Yet if none of those luminaries can really define balance in a way that anyone would understand, what chance have I? "Balance is when all the taste elements of a wine are so harmonious that none grabs your attention. Acidity is most important: a balanced wine must have enough acidity so that you do not tire of it, yet must not taste too sharp. 'Balance' is as much the absence of things (too much power, too much fruit, too much tannin) as the presence." Now if I can get that down to shelf-talker size, maybe I can start a revolution. When I was first being taught winemaking (Pinot Noir and Chardonnay)in 1979 by my dear friend Mike Richmond he hammered into me that the three most important things in a wine were balance, balance, and balance. This is also the same guy who ten years later whem I had decided that higher acidity was what Acacia wines needed at that time told me as head of sales for the company to "cut it out, nobody is going to drink austere California wine"
I'm very pleased to see balance as a topic for Pinot Noir these days having always been a fan of the old fashioned middleweight Pinots, but am leery of conflating higher acidity with balance. I consider balance to be a fabric, acidity or any other single part to be one of the threads. "I love great wines, but over the course of a month, honestly I would rather drink more wines that are balanced than wines that are special." You took the words right out of my mouth. As in all things vinous, I'm assuming that balance is up to the beholder. I Can't stand that butter-coated Chard, but have friends that adore them. I love the palate cleansing edge of Sauvignon Blanc, but those same friends hate it. one back to that bottle for yet another pour. One doesn't have to search for it. I love pinot with good acidity. I agree we do not have to be too sennsitive how the wine is made. But if the acidity I love is just a result of acidification,rather than good farm work,nothing would be so depressing. PS I love wines from Franken,Germany. I notice that what I love about the 2008 vintage pinots from the Willamette Valley (in general) is their amazing balance. They are harmonious - some were outstanding in my view (like the St. Innocent Momtazi) but almost all I tasted have a wonderful balance. The balance does not preclude some being outstanding, but sets the harmony for some to excel. Balance is easy: Nothing is sticking out. "Balance is when all the taste elements of a wine are so harmonious that none grabs your attention." - Yes, I agree: structural components should neither be deficient or in excess, BUT I would further narrow it down to say that things are in harmonious proportion, BUT appropriate for variety and region. A good Pinot by nature has more acid than Syrah. A good Viognier, Marsanne or Roussanne will be less acidic by nature than an Albarino. A Teroldego will not and should not be as tannic as Cab. It's about the DNA of these varieties. There will be regional variation but when you consider that a clone is genetically identical to the plant from which it (or its progenitor) was cut and when you consider how many thousands of acres are planted to a single clone, meaning millions and millions of genetically identical vines (337, anyone? ), then it stands to reason that wines made from these vines should be fairly consistent in their structure. Allowing for some regional character (not stemming from local practices, unskilled winemaking, etc) cannot be discounted. I made a typo: it should be "Sauvignon Blanc", of course. I would generally agree with your definition of balance, Blake, but I think it might be a bit reactionary to say that acidity is the most important. It might be the most important element to get people on the right track to making balanced wines RIGHT NOW, but that's only because it's missing in many wines. All the elements have equal importance because, as you say, too much or too little can throw a wine out of balance. Acid is the most important of all.Because you can drink a wine without tannnin.You can raise alcohol level easily.But you CANNOT retain real acid by any chemicals. @Sato,MItsu: Not sure I understand your point. Wines are routinely acidulated with tartrate to lower pH (increase TA) to 1) affect taste and structure, and 2) achieve a safer state, microbiologically speaking. Yes, fruit can loose acidity, but as I said, wines are frequently acidulated because winemakers feel that this is a way to get a wine that has a balance of ripe fruit expression and good acid structure. SUAMW: I understand why you want to add variety and region to a definition of balance, but I oppose doing so, and here's why: people will use those as an excuse. I want a Zinfandel that's balanced, not balanced for Zinfandel. It's not a small distinction. As Ray Isle pointed out, alcohol level isn't the key to balance, so there's no reason a 14.8 percent Zin can't be balanced. But I want to taste harmonious elements, not to be told, "Oh, that power that smacks you in the face, that's what Zin does in this region." Sato-san: At last, a man who stands up for Franken wines. I completely agree with your definition of balance - I'm using pretty much the same throughout all of the wine descriptions in my blog. Balance is something I value the most in wines, and it can be achieved at any level of alcohol, exactly as you pointed out.